Noel "Deep Blue Pearl Mermaid Princess"
Noel is the Mermaid Princess of the Arctic Ocean, and the keeper of the Deep Blue Pearl. She was captured by Gaito, and so she only appeared near the end of the first season. Lucia and Co. had come to face Gaito and liberate everyone. Noel was freed and reunited with her younger sister, Caren. When Gaito was defeated, Noel leaves to help rebuild her kingdom. She comes back to the human world with Caren and Coco, but they are only comic relief. Noel returns a second time when the Mermaids fight Michel. Noel is portrayed as the smart and quiet type. 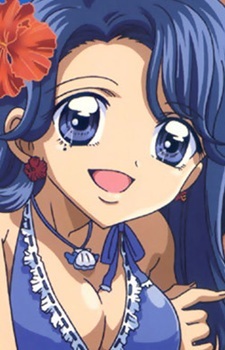 She is involved in most of the second trio's crazy things, such as flirting with Nagisa and Masahiro to get Hanon and Rina jealous. In Ep. 18 of Pure, she whips out glasses and is helpful to finding the theory of Miracle Bay. Noel is not the one who makes a decision without thinking, but she is willing to sacrifice herself if it means saving her friends. Noel has three different forms: Mermaid Noel, Human Noel, and her singer form, Deep Blue Pearl Voice. She has no image song.